The phantom sixth member of the "Generation of Miracles." He has a very weak presence and often seemingly appears out of nowhere as a result. At the first glance all of his abilities seem to be below average, but despite being bad at dribbling and shooting he can be a dangerous opponent. He specializes in circulating passes without being seen. Because of his largely complementary skill set, Kuroko considers himself a "shadow" whose goal is to help his "light" achieve greatness. After being defeated by Aomine, Kuroko trains himself to evolve his play style. He overcomes his previous limitations, and has developed the ability to move past players unseen while dribbling the ball, creating his own 'vanishing' drive. After his misdirection effect runs out, Kuroko can force the opponent to just focus on him, allowing his teammates to go by unnoticed. 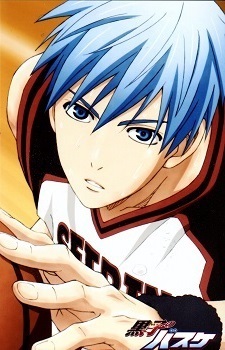 Thanks to Aomine's coaching later on, Kuroko also develops some shooting skill, making his own shooting style called "Phantom Shot" where the ball disappears. Akashi was the one who first encouraged Kuroko to awaken his ability in passing. Later on, Akashi was also the one who allowed Kuroko to join the first-string team. Aomine and Kuroko used to be best friends, their skills largely complemented one another. When Kuroko screwed things up on his first match as Teikou's first string member, Aomine was the one who prevented Kuroko from being taken out, as he pleaded the coach to give Kuroko another chance, and if Kuroko screwed up again, Aomine will take responsibility and leave the team as well. Good for them, Kuroko showed his true potential and was approved as the team member. But as Aomine's skills grow insanely strong and nobody was able to beat him, his and Kuroko's relationship grew further apart. Even though Kuroko encouraged him to keep doing his best because someday a strong opponent will surely come, Aomine wasn't convinced, and they stopped playing together ever since. Kuroko was really heartbroken by this, and following this event, all GoM members' talents start to blossom, and Akashi 'changed'. The team started to play individually, and nothing mattered more to them than winning. Kuroko as well, even though hurt, still played all the match without question anyway. At some point, Kuroko watched Seirin High's basketball match. Kuroko was touched by their play and teamwork, and thought of them as a great team. He remembered the brief good old times he and his teammates used to have. Although Kuroko proceed to play the matches with the rest of GoM's members, everything changed when Kuroko's old friend, Ogiwara and his team, played against GoM at the finals on their 3rd year. Kuroko was injured and so unable to play. He pleaded Akashi to take them seriously, but in the end, GoM didn't even see them as a worthy opponent. Ogiwara's team tasted a really crushing, painful defeat, while GoM wasn't even trying their best. Kuroko was really devastated by this, and he thought of quitting basketball. Kuroko paid a visit to Ogiwara's school to apologize, but then found out that Ogiwara has quit the team. Once again devastated, one of the team member gave Kuroko Ogiwara's wristband, saying that Ogiwara wanted Kuroko to have it, that Ogiwara was never angry at Kuroko, and for Kuroko to never give up. Kuroko accepted the wristband, and with a brand new resolve, he returned to his school. At the graduation ceremony, Akashi asked Kuroko to meet him. Akashi then asked Kuroko what his resolve is, and Kuroko answered that he will never 'run away' again. He then entered Seirin High School and joined its basketball club.